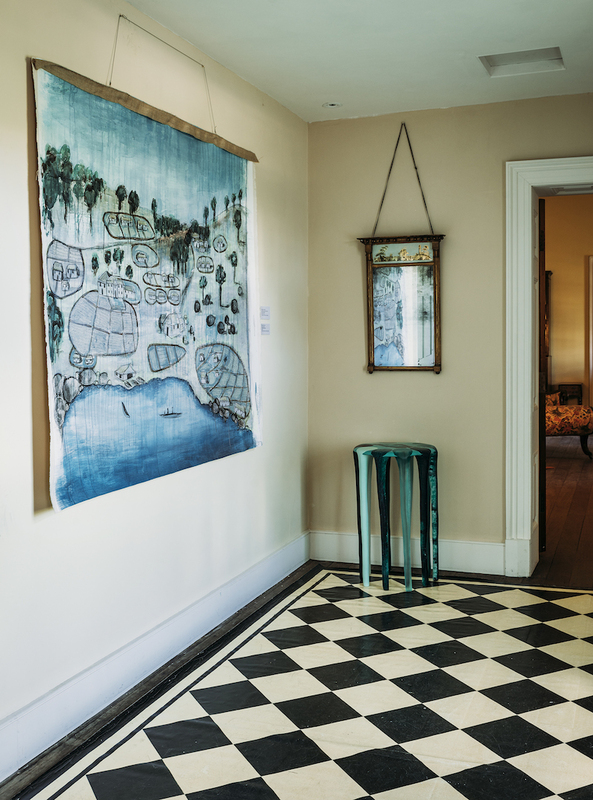 We love a ramble through a stately home, but for antiques plus attitude don't miss brilliant show 'At Home: Modern Australian Design', taking over Sydney's Old Government House in Parramatta until 22 January 2017. Hosted by the National Trust and curated by eagle-eyed design editor David Clark (who formerly helmed Vogue Living), it places hand-picked contemporary objects by over 60 of the country's leading designers cheek-by-jowl with historic pieces, exploring the nation's domestic aesthetics. The result is a marriage made in style heaven, with cutting-edge furniture, lighting, textiles, wallpaper and accessories both complementing and contrasting with the original interiors, making you look at them in a fabulously fresh light. The kernel for the show sprang from the 2011 'Broached Colonial' collection by Melbourne design studio Broached Commissions, which included work by Adam Goodrum, Charles Wilson and Trent Jansen and riffed on colonial Australia. Clark was keen to see the pieces in the context of Old Government House, alongside other modern designs. While some contemporary items have a colonial feel – from decanters and tea sets to sleekly crafted wooden chairs – others are digitally produced, streamlined products that bring 21st-century bang to the building's vintage buck, or draw on radical materials including salvaged car parts, carbon fibre and glossy resin. An impressive roll call of local talent is on display, from Adam Goodrum's laser-cut, folding 'Stitch' chair, designed in 2008 for Italian brand Cappellini, to Grant and Mary Featherston's vintage 'Scape' armchair from 1960, reissued in 2016 by Grazia & Co. Established pieces by Marc Newson, Robert Foster and Dinosaur Designs are here, alongside newer creations by up-and-coming names. We love Adelaide duo Daniel Emma's 'D.E Desk' accessories, Henry Wilson's bronze 'Fin' bookends, 'Stack' trays and 'Surface' sconce lamps, and Trent Jansen's terracotta 'Jugaad with Pottery' vessels, created in India. Lovers of wallpapers and fabrics should head upstairs, where prints and textiles draped on tables and tacked to walls include work by Anna Spiro (behind the interiors of Australia's Halcyon House hotel), Oscar-winning costume designer Catherine Martin, flora and fauna-inspired Cloth (aka Julie Paterson), photographer Martyn Thompson, painterly Shilo Engelbrecht, and nature-influenced Utopia Goods. There's a compact design store and alfresco cafe for shopping and sipping afterwards. The Fizz heard a rumour that the upstairs lounge is haunted, but there's not a ghost of a chance that would put us off this thought-provoking show! 'At Home: Modern Australian Design' is at Old Government House, Parramatta Park, Parramatta, western Sydney, until 22 January 2017. Open Tue-Sun, 10am-4pm (last admission 3.30pm); AU$18.50 for adult tickets, online or on the door.